Gosh, I guess it’s time for a blog post, right? Our blog has been sorely neglected- last week we were at college orientation and then on vacation in New Hampshire. Needless to say, there hasn’t been too much cooking going on in our kitchen, but we’re trying to get back to it. The food at orientation, while tasty and better than a lot of cafeteria food, wasn’t exactly healthy, nor was the food we ate on vacation. 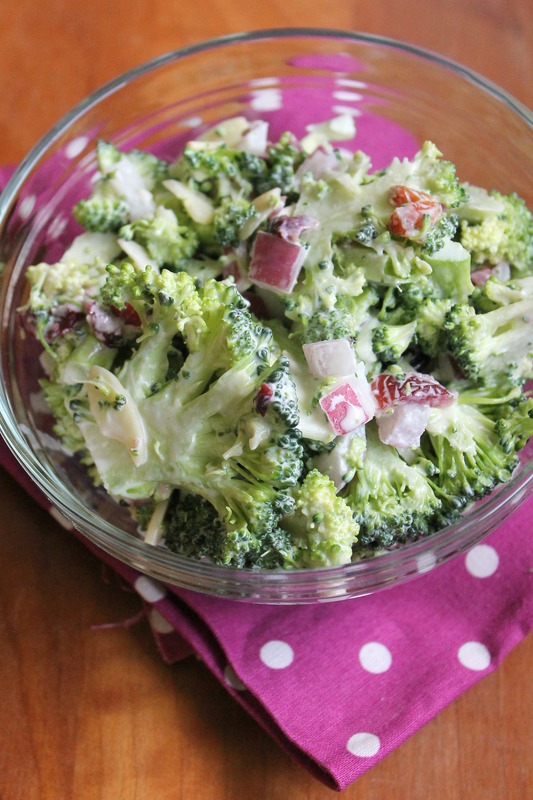 Vegetable-heavy foods like this broccoli slaw sound pretty good right now! We decided to make this slaw on a whim as a side for burgers and it way outshone them. Who would’ve thought that a bowl of 2 heads of broccoli could taste fabulous? I am a believer now, but trust me- in the past, broccoli has been far from my favorite vegetable. This slaw could change that. 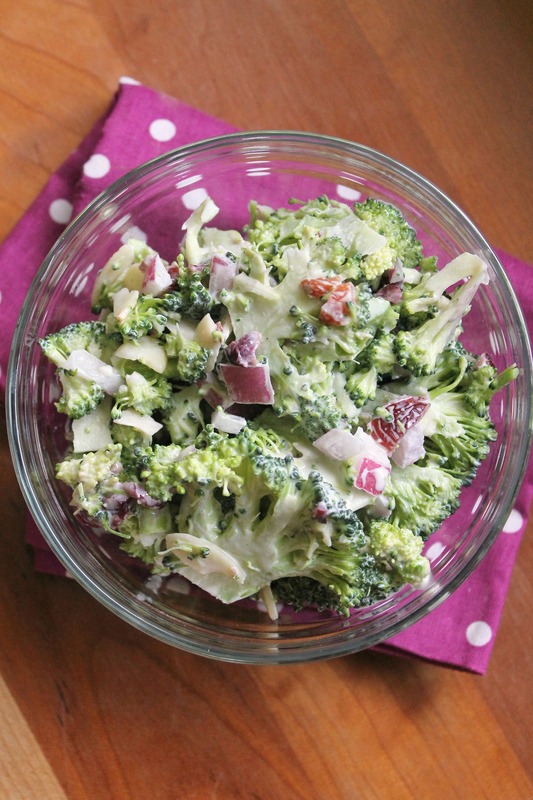 Crunchy raw broccoli is tossed with a buttermilk dressing, diced red onions, toasted sliced almonds, and dried cranberries. The combination is fantastic, and I could probably eat half of the batch for lunch sometime. It really is that good, and you’ll never want to go back to regular coleslaw ever again. Trim the broccoli (remove the large, hard stem) and cut it into large chunks. Slice each chunk into thin slices. Any large stem pieces can be cut into thin slices and then stacked and cut in the other direction to form thin sticks. The florets should be cut into thin slices. Whisk the buttermilk, mayonnaise, vinegar, sugar and salt in a small bowl until smooth. Stir in the onion. Let the dressing rest for about 10 minutes to mellow the flavor of the onion. Toss together the broccoli, almonds, and cranberries in a large bowl. Pour the dressing over this mixture. Add black pepper to taste (feel free to be generous with it!). Stir until the dressing evenly coats the broccoli. Enjoy!